Our team withstood one of the most unpredictable winters in recent memory. As we finally head into warmer weather, we reflect on all we were able to accomplish under the ice this past season. The ice may have been thick - really thick - four to five feet thick. But that didn’t stop us from taking on the most demanding under-ice dive projects. Whether it's inspecting several thousand feet of an old dock structure along the shores of Lake Superior or repairing the guide walls at a lock and dam on the Mississippi River, one of the best times to get underwater work done is during wintertime because thick ice results in waterways clear of traffic. But that doesn’t mean under-ice inspection and construction is without its challenges and dangers. It requires careful planning, safety measures, the right equipment, and most important of all, skilled divers. During the winter months, there is often only one way in and one way out of the fascinating world of working under the ice. Once we get the call for an ice dive project, our first step is to hold a preparatory safety meeting with the customer. At this meeting, we’ll get a preliminary assessment of the thickness of the ice, which helps determine what equipment we’ll need for the project. It’s essential to accurately assess ice thickness because it will have a bearing on the equipment needed and personnel required for the dive. Thicker ice can mean additional equipment to our typical dive station setup, which has basic air compressors, dive umbilicals, communications, video units, plus all different types of tooling. Also, thick ice and freezing temps mean we’ll have to make an extra effort with tenders and ice-clearing activity to keep the holes open. The type and size of equipment going in and out also impact the size of the openings and the effort we’ll need to keep them from freezing over - a diver’s worst nightmare. 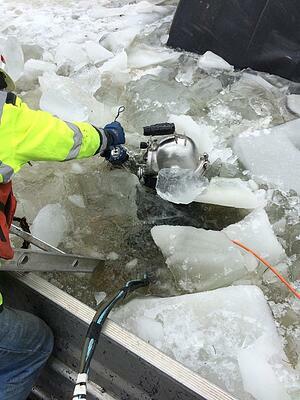 On a recently completed inspection project near Duluth, MN, the ice was four to five feet thick. That was an extreme case which took more time than usual to assess the situation, make our holes through the ice, then keep them open. Condition assessment of two thousand feet of an old dock wall structure along the Lake Superior waterfront. 4-5-foot ice thickness, depth of 25 feet with 4 feet of visibility, freezing temps, time to cut through ice, efforts to keep the holes open, need to move dive stations every 300 feet. The extreme distance to cover meant we were limited to doing surface supplied diving every 300 feet. The process was to cut holes, do the inspection, then load everything up, move the dive station another 600 feet away and repeat the process of drilling holes, and doing the inspection while tenders kept the 4-5 feet ice holes open. Completed inspection of the entire length of the seawall/dock wall with a 5-man crew. We’ve had situations where the holes have refrozen while the diver was under it. It’s up to the tender to pay close attention, or it starts to crust up and depending on the water temperature, it can freeze over pretty quickly. On the Duluth project, they had to continually remove and break new ice to keep the holes open. 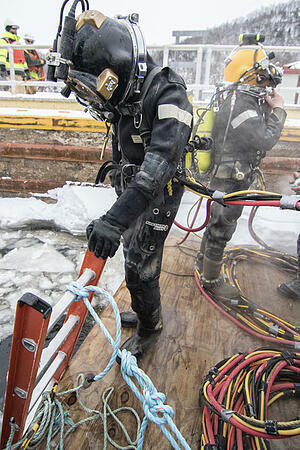 Safety of under-ice dive operations can’t be overstated or taken for granted. It permeates through everything - from the initial safety meeting to the equipment we deploy and the divers we hire - safety is of paramount importance. For starters, J.F. Brennan Company is an active member of the largest association for divers in the United States, the Association of Diving Contractors International (ADCI). The ADCI writes the rules for diving safety in the U.S. Dive safety is enhanced by having a diving safety person to oversee our program. Sitting on the International Board for Diving Safety, this individual helps inform the board and the Brennan team of any rules and regulations pertinent to safe diving practices. We always strive to do things the right way, by the book. We are taking all of the safety factors into consideration on a daily basis. This not only keeps us safe under the ice but shows our clients that we go above and beyond concerning safety standards. 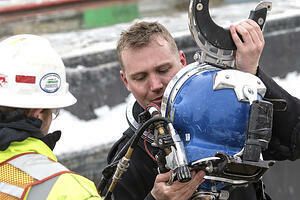 Some marine construction companies feel in-house training is sufficient for their divers. At Brennan, we choose to only hire divers who have a diploma from a commercially-accredited diving school in the United States. This is a key differentiator for our company, particularly when competing for large, Federal contracts, such as U.S. Army Corps of Engineers projects. All our divers are certified, and this factor sets us apart. Once divers have obtained the appropriate education and are then hired by Brennan, it’s just a matter of teaching these hardworking individuals the elements that contribute to our standard of work, and about the oftentimes harsh environment of commercial under-ice diving work in inland waterways. 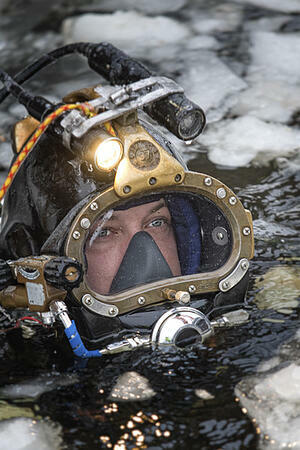 We are faced with many questions when explaining under-ice dive projects. Many of the questions pertain to the type of equipment used and the temperature challenges faced for both divers and equipment. What’s it like under the ice in lakes and rivers of the Midwest? How do we keep our divers safe and warm? Is there anything unique about the equipment used to do the work? It’s a fascinating world below the ice. With clear visibility, it can be similar to what you’ve seen on television. However, we don’t always get to dive in pristine waters or conditions. It’s not uncommon for our divers to experience zero visibility environments. 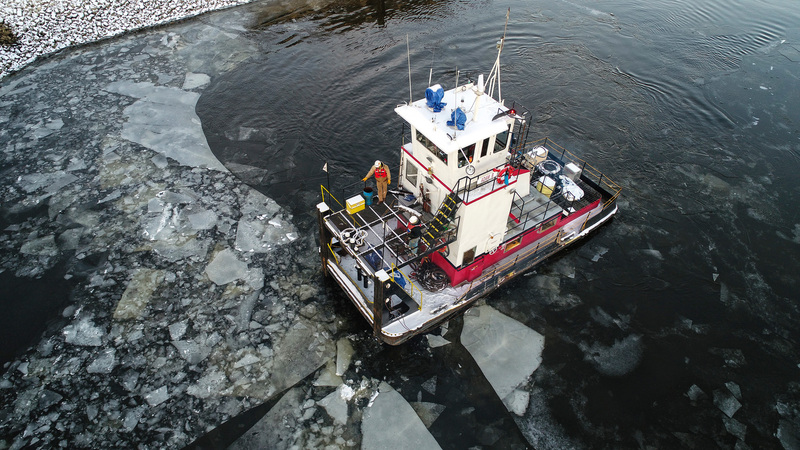 It is not uncommon for divers working on inland waterways in the Midwest to contend with under the ice conditions with swift currents and hazardous materials: fuel, chemicals, floating debris, sewage, and more. Having highly-trained and adaptable divers is critical to tackling the challenges presented by the diverse environments of each unique project. While we are called to work in harsh winter and under-ice environments throughout the Midwest - and beyond, we do follow some strict safety parameters. For example, broken up ice underwater flowing downstream can cause serious harm to a diver. We monitor for unsafe conditions. And we’ll do what it takes to adapt to potentially dangerous situations or make a no-go call when necessary to keep our divers protected and safe. (4 and 5a) on the Upper Mississippi River. Ice thickness varied from 1 -2. 25 feet in depth with 2-3 feet of water visibility. Had to consistently re-open ice for diver access and air tools were constantly freezing up and would stop working at times. 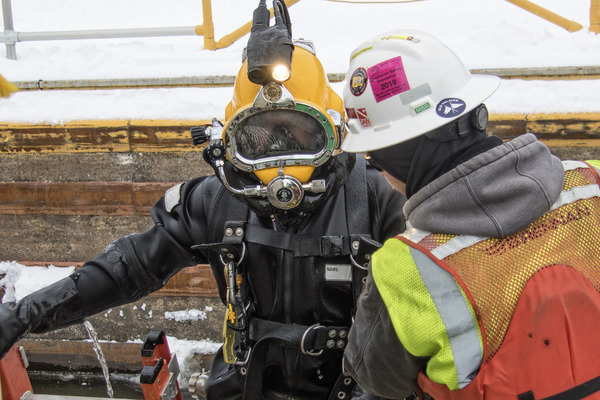 Used two, 5-man crews at each lock and dam with standard commercial dive package, an excavator to keep access open, hot water system for divers, underwater tools and equipment. Completed all underwater concrete repairs. Pumped thousands of yards of concrete underwater in freezing conditions. How Do Divers Stay Warm? This is one important area where having first-rate equipment comes in. Unlike most dive companies, we provide all the equipment for our divers. Whether it’s the highest quality helmet, our hot water system, or the dry suits we supply, all our diving equipment is certified, regularly inspected, and of top-grade quality. 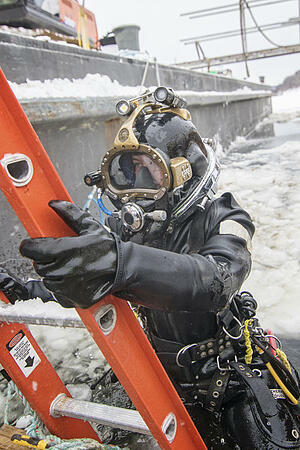 There are two ways our divers stay warm in frigid water temps: hot water suits and dry suits. Our hot water system is used on most jobs and on the bigger projects. It not only keeps our divers comfortable but allows them to work longer, too. How Does a Hot Water System and Suit Work? The hot water system works to heat the water from whatever body of water we’re working in and then pump it back down to the diver. The diver wears a suit with little capillary tubes. Warm water is pumped over his body through these tubes the entire time he’s under the ice. This system can keep divers warm upwards of seven hours in 33-degree water. It’s an innovation our divers love in the colder climates. What’s the Difference Between a Wet Suit and a Dry Suit? The other method of dealing with the cold is what’s known as a dry suit. You’re most likely familiar with a wet suit for summertime use, which lets water in and your body heats it to keep you warm. But in a dry suit, you don’t have any water coming into the suit. Everything is sealed off around your neck, hands, and feet. Your internal body works to keep heat inside the suit. How Long Can You Work Under the Ice in a Dry Suit? The main limitation with dry suits is they’ll only work to keep you warm from three to four hours - the max amount of time your hands and feet get cold. Definitely, the preferred method in extreme cold is the hot water suit and system. Like our hot water system and diver suits, the equipment we use below the ice in extreme conditions must be built to work for, not against us. We must also make use of high-caliber video equipment for monitoring and accountability of what’s going on throughout the dives. Underwater cameras are installed on every diver, so the customer can take a live look at what’s going on at all times throughout the dive. Afterward, the video and audio footage provide a reference of what exactly took place and helps give in-depth reporting of the project from beginning to end. We spend hundreds of thousands of dollars each year on diving equipment and construction tools to accomplish the work done under the ice. Whether you’re a diver looking for your next adventure or a prospective customer needing expert help, we will provide you with nothing but the best in equipment and performance. Most of our under-ice inspection and construction work is in the Midwest. We’ve done work in Minnesota, Wisconsin, Iowa, Illinois, Michigan, Nebraska, and Indiana. We will soon have crews in Arkansas and on the East Coast, as well. Bottom line, we’ll go wherever the customer calls. 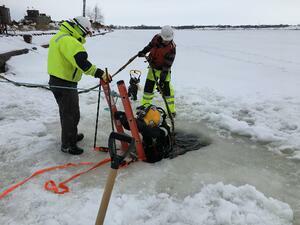 We work for other marine construction companies that don’t have the capabilities for under-ice dives. Additionally, we do a lot of work for the U.S. Army Corps of Engineers and the United States Environmental Protection Agency (EPA). And, we’ll even go to sunny Florida or the shores of California. Are you looking for an experienced, certified commercial diver with the knowledge necessary to perform thorough underwater inspection, construction, and reporting? Learn more about Brennan’s marine construction and dive services.